The format follows that of the other volumes in The Chemistry of Functional Groups series; commissioned chapters address theoretical, structural, and stereochemical aspects before considering more specialized topics in synthesis, photochemistry, spectroscopy, and biochemistry. Includes full reaction details and extensive references. Sulphinic Acids and Carboxylic Acids--A Comparison (C. Stirling). General and Theoretical (H. Basch). Sulfinic Acids and their Derivatives. Sterochemistry and Chiroptical Properties (A. Nudelman). Mass Spectra of Sulfinic Acids, Esters and Derivatives (K. Pihlaja). The NMR and ESR Spectra of Sulphinic Acids and Their Derivatives (A. Bassindale & J. Iley). Syntheses of Sulphinic Acids (U. Zoller). Synthese of Sulphinic Esters (U. Zoller). Cyclic Sulphinic Acid Derivatives (Sultines and Sulphinamides) (D. Dittmer & M. Hoey). Acidity, Hydrogen Bonding and Complexation (H. Fujihara & N. Furukawa). 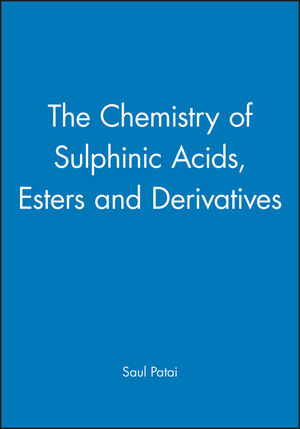 Sulphinic Acids and Esters in Synthesis ( J. Drabowicz, et al.). Photochemistry of Sulphinic Acid Derivatives (G. Capozzi & P. Sarti-Fantoni). The Oxidation and Reduction of Sulphinic Acids and Their Derivatives (J. Hoyle). Syntheses and Uses of Isotopically Labelled Sulfinic Acid Derivatives (S. Oae & H. Togo). Thermochemistry and Thermolysis of Sulphinic Acid Derivatives (B. Bujnicki, et al.). Electronic Effects of SOOH and Related Groups (J. Shorter). Thiosulphinic Acids and Esters (T. Takata & T. Endo). Sulphinyl Chlorides and Sulphinic Anhydrides (J. Tillett). Sulphinamide Reactions of Sulphinic Acid Derivatives (J. Tillett). Mechanism of Nucleophilic Displacement Reactions of Sulphinic Acid Derivatives (T. Okuyama). Biological Activity of Sulfinic Acid Derivatives (A. Kalir & H. Kalir).